Ongoing support and ecommerce development for No1 Traveller, offering executive lounge services at Heathrow, Gatwick & Stansted. From functional specification through to developing their ecommerce store, this website takes bookings for everything from chauffeur-drive, express trains, airport parking, lounges, airside bedrooms, travel spas, and VIP departure services. Web developments include querying real-time availability using web API's and then pushing bookings through to the relevant airport lounges, plus distributing messaging to all appropriate services eg concierge, beauty therapists etc. There is also extensive affiliate tracking and dynamic discount code features. The latest new features are direct query/booking of 3rd party services via XML for Heathrow Express and Car Parking across 5 airports. 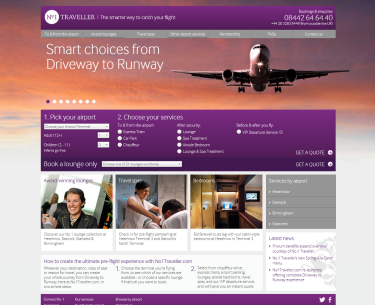 Ecomm website serving 6 UK Airports. We contracted Impact to help us develop an ecommerce website offering executive lounge services at Heathrow, Gatwick & Stansted. Impact assisted in writing the functional specification and developed the ecommerce store from scratch. Over time we have enhanced the website to now take bookings for everything from lounge access to limousine hire, and airside bedrooms to spa services. This website queries real-time availability using web API's and pushes bookings through to the relevant airport lounges.